A more recent common fashion house practice is to collaborate with artists to inspire their collections. And as the Creative Director of Louis Vuitton, perhaps no one else has applied this practice as much as Marc Jacobs. His most recent being: commissioning his own personal tattoo artist, Scott Campbell to showcase his monograms for the Spring/Summer Men's Collection 2011. Lately, Campbell at 32, is becoming more recognized for his art--he's had his second solo show at a gallery in Noho over the summer. The tattooist-turned-artist has also inscribed markings on celebrities such as, Josh Harnett, Courtney Love, Heath Ledger. 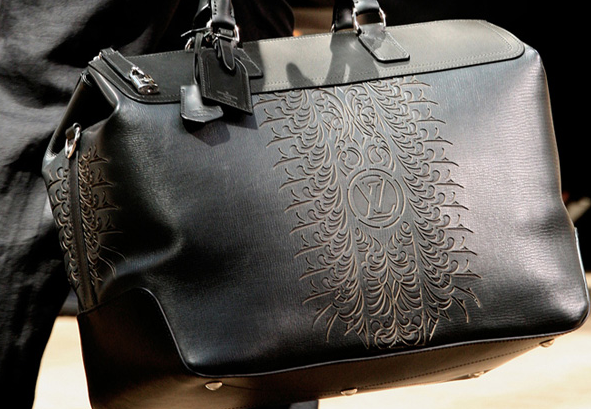 Both designer and tattooist artist have grown into becoming New Yorkers--bringing some of their NYC street influence into the runway upon launching LV S/S men's 2011 collection, just this June. (See video below). In the past, Jacobs has recruited the likes of Stephen Sprouse, Takashi Murakami, and Richard Prince to work with him on creating for Louis Vuitton. Have a watch at the promotional video (above as well); it presents a-day-in-a-life of Campbell--etching his designs away for the fashion house, and getting ready to publicize his print collaboration with the brand, in Paris. Plus have a look at the extra video (below), as the Brooklyn based artist talks about the natural transition from engraving on skin to furniture, and eventually on canvas (circa 2008) .